Hi lovelies! 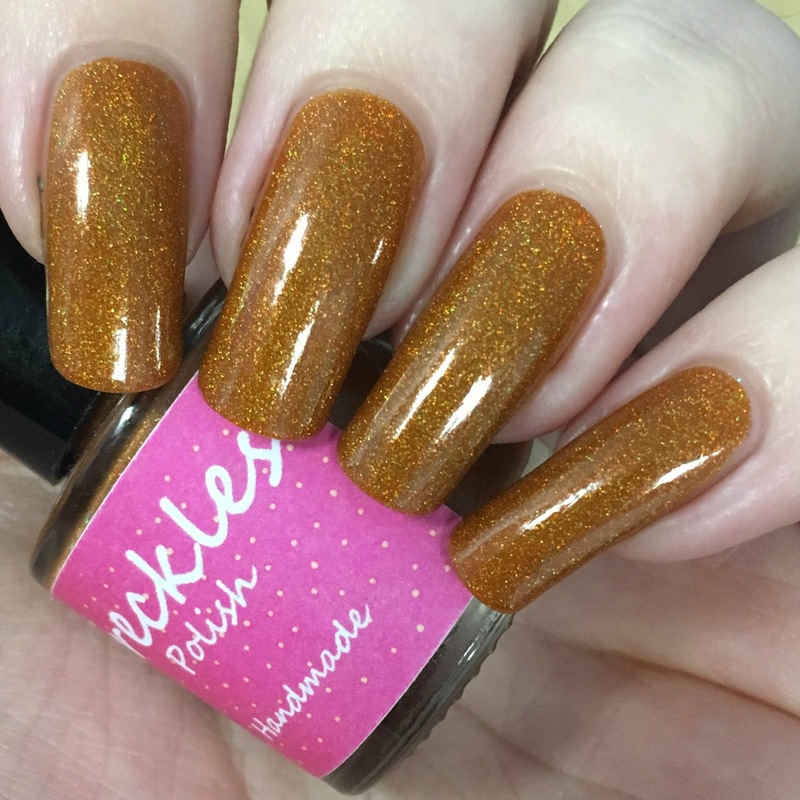 Today I have my first Freckles Polish swatch to share with you. I honestly have no idea how I've managed to go so long without trying Freckles! Julieann brings out some gorgeous polishes. I finally bit the bullet during a flash offer and was lucky enough to get 'Pumpkin' from the Halloween trio as a freebie. Read on for my swatch and more info! 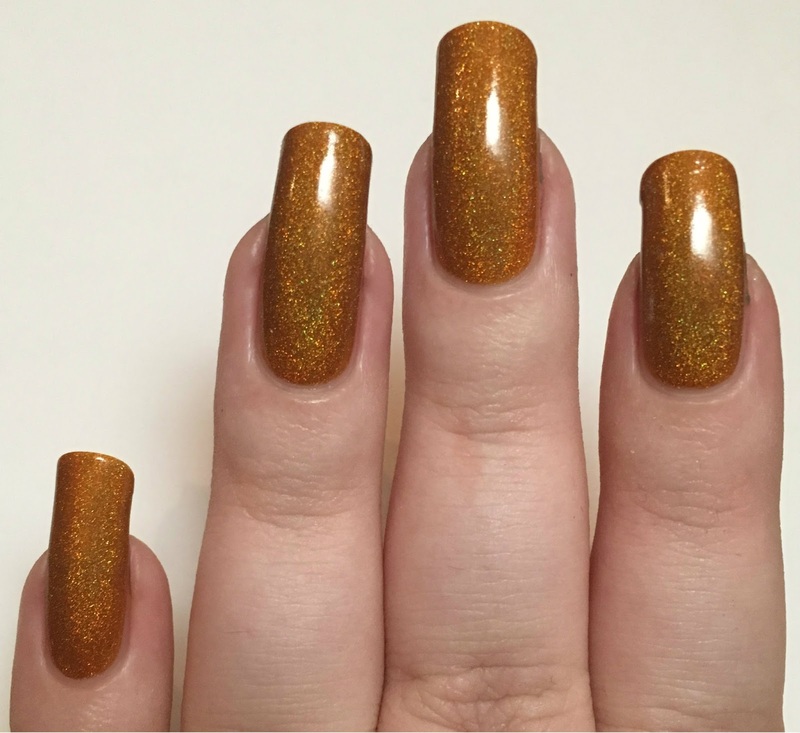 'Pumpkin' is a burnt caramel orange holographic. The formula is so smooth and easy to apply. It is a little bit sheer on the first coat but builds up nicely. I added a third as I could just about see my nail line, but you could easily get away with just two. The holographic in this is so strong! Below is three coats and topcoat. This is where I'd normally finish my post, but I have new lighting to play with! Many of you already know I take my pictures in natural daylight which can be tricky, especially during the darker months. I have tried a lightbox or two but never found a good fit. 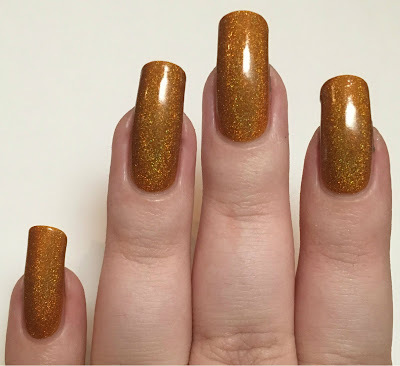 On the advice of Kirsty (FairyTales Nails) I recently purchased an Ottlite daylight lamp, and here are the results! What do you think? I am impressed with both the polish and lamp! The quality of the polish is amazing, and I can't wait to try the others I purchased. My Ottlite lamp is my new favourite thing, ever. I didn't realise it would improve my photos quite so much - you can see the holographic effect so much clearer! I'm so excited to be able to play all day, everyday. It might take me a while to get the lighting just right though, so bear with me! 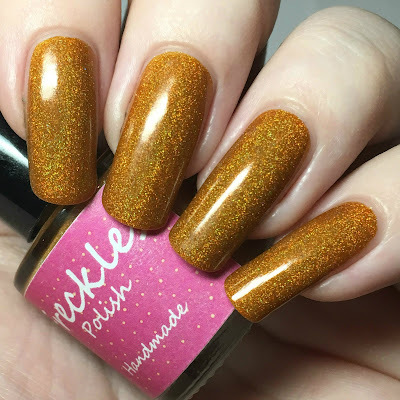 Unfortunately Freckles Polish 'Pumpkin' is no longer available, but there are so many other gorgeous shades on etsy here. You can also check out Freckles on Instagram here for more swatches. The color of this polish is beautiful! I love these caramel shades. I just realised I don't own any caramel polishes - time to haul! What a pretty colour! I wish I knew about it sooner since it is definitely my kind of colour! I like how this colour looks on you! Gorgeous! This is a gorgeous fall color! And your nails are just beautiful!! Wow, I really like this polish, it looks great on you! I rarely do my nails when there's enough daylight to get a good picture - especially with winter well on its way. It's just easier to use lamps! new lighting is always such a scary idea! It looks great though. Wow this is a gorgeous shade & I agree that Freckles polish brings out some amazing shades. This looks amazing on you too. With artificial lights I think pics come better but holo n chromes are look more stunning in sun light or day light. I love always your pics. Great shade. Loved it. This is the official nail polish for fall. Your nails are gorgeous as well!